released stats on how many indoor areas have been mapped. 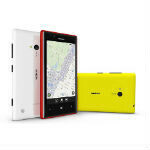 Nokia likes numbers though, and has announced that HERE Maps now has Venue Maps in 45 countries. This is a pretty impressive update, actually. In the 45 countries that are getting indoor maps, there are 49,000 facilities that will be getting the indoor map treatment. Over half of the maps are for shopping malls, but there are also public transit stations, grocery stores, airports, theme parks, and the reason they are called "Venue Maps" and not "indoor maps" is because it includes famous outdoor areas like Times Square in New York or Carnaby Village in London. In addition to stores in various indoor locations, Nokia has added helpful items like ATMs, restrooms, escalators, and airport gate numbers to the maps. The new Venue Maps are available in Nokia's HERE Maps as well as Bing. I want to know what isle and shelf to find the darn grocery item my wife wants me to pick up!